Researchers looking at the relationship between bullying and substance use in teens are coming up with some surprising findings. This is especially true in the area of bullying victimization and substance use, according to Amanda Nickerson, PhD, Professor and Director of the Alberti Center for Bullying Abuse Prevention, Graduate School of Education at the University of Buffalo in New York. Certain factors that lead to bullying perpetration may also lead to substance use, such as less parental monitoring and having a more difficult temperament. Some of the motives may be the same for bullying and substance use, such as sensation seeking or trying to obtain higher social status, Dr. Nickerson said. Dr. Nickerson, along with colleagues Jennifer Livingston, PhD (the principal investigator) and Kathleen Miller, PhD, are conducting a longitudinal study of 13- to 15-year-olds looking at teen health and relationships. The study, funded by the National Institutes of Health, has enrolled about 800 teens so far. They answer questions at the beginning of the study, and then every six months for two years. One subset of teens who say they have been bullied is providing information online daily for eight weeks on their experience of being bullied, coping strategies, and whether they are using substances. “We are trying to figure out whether starting to use substances is related to their bullying experiences,” Dr. Nickerson said. “We’re looking for risks and protective factors—are there particular things about them, their family situations or coping strategies that protect against substance use?” Overall about one-quarter of the teens in the study say they have been bullied. While they did not find any link between bullying perpetration and energy drink use, they were surprised to find a link between energy drink use and bullying victimization. “We want to further examine this, and see what may be involved in this, such as social skills, hyperactivity or anxiety. Are they being victimized and using energy drinks to cope, or are they using energy drinks as part of anxious behavior and this leads to victimization?” Dr. Nickerson said. Another area they are studying, led by Dr. Livingston, is the relationship between bullying victimization, alcohol use and parental support. The researchers looked at 119 kids who said at the beginning of the study that they had consumed alcohol in the past month. 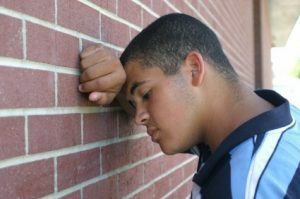 They found teens who were severely bullied and who had strong support from their mothers and family cohesion—such as family members asking each other for help and spending free time together—were less likely to drink than bullied teens without strong maternal support and tight family bonds. Getting help for a young person with a mental health disorder or a substance use problem is hard. It’s even harder when these disorders occur in the same person , Harold S. Koplewicz, MD, President of Child Mind Institute, and Fred Muench, PhD, President of Center of Addiction, explain. I was never bullied as a young person. I let bullies know from words and action that I was not frightened from age 8 years. Interestingly I was dependant on substances for 25 years from 15-40 years.